Drivers may enter the championship once their season application has been accepted and processed. With regards to the 2019.1 SA simGT Series qualification rounds for this season: SA simV8 Series Division 1, SA simGP Series Division 1, and SA simGT Series Division 2; drivers must complete at least one lap in the hot-lap qualifying (HLQ) or Last Chance Qualifying (LCQ) sessions leading up to a particular round, to complete their entry to the specific round. Drivers who take part in HLQ and LCQ are catered for. If there is space in a particular round, a driver who did not do HLQ or LCQ can request a grid slot from the race director; Jason Holden-Jones. A request may be denied to a ‘non-HLQ’ or ‘non-LCQ’ competing driver. 1.2 By entering a SIM RACE SOUTH AFRICA season, entrants are giving permission to SIM RACE SOUTH AFRICA to use their signed up names in website and social media articles. The minimum number of drivers entered into a race belonging to the same team is limited to one and the maximum number of drivers in a race belonging to the same team is limited to two. A team may include reserve driver/s to replace absent driver/s. Teams may have affiliate teams. 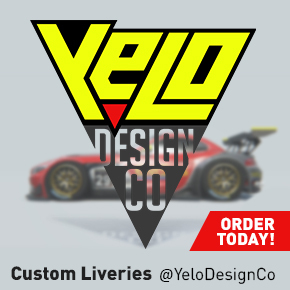 – All logos and graphics appearing on the cars are to be used with full permission of their owners. Proof may be required to verify such permission. In the event of a team not being able to supply its own team customised livery, the team is required to use one of the SIM RACE SOUTH AFRICA default skins. The race format will consist of one 15 minute qualifying session and one 90 minute race session. The races are lap limited, races may be fractionally shorter or longer than 90 minutes. A mandatory pit-stop is required in every race. Each driver must conduct at least one pit-stop per race. The mandatory pit-stop cannot be conducted during the first lap and the final lap of the race. To qualify for each SA simV8 Series Division 1 round, each driver has to produce a top 20 fastest lap time in the practice session between the Thursday and the Sunday before each Division 1 round. Drivers falling outside of that top 20 can then race in the Division 2, or the subsequent Division race. The top 3 finishers in the Division 2 race will automatically qualify for the next SA simGT4 Series Division 1 race. To qualify for each SA simGP Series Division 1 round, each driver has to produce a top 20 fastest lap time in the practice session between the Thursday and the Sunday before each Division 1 round. Drivers falling outside of that top 20 can then race in the Division 2, or the subsequent Division race. 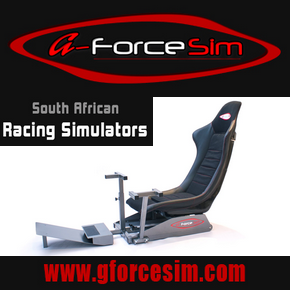 The top 3 finishers in the Division 2 race will automatically qualify for the next SA simGP Division 1 race. To qualify for each SA simGT Series Division 1 round, each driver must have either; achieved a Top 7 result in the SA simV8 Series previous Division 1 round, or achieved a ‘next’ Top 7 finish, which excludes those drivers who have already qualified through the SA simV8 Series, in the SA simGP Series previous Division 1 round. Other alternative methods are qualification through achieving a Top 5 finish in the SA simGT Last Chance Qualifier (LCQ) session or a Top 3 finish in the SA simGT Series Division 2 race from the previous round. A driver must set at least one lap time in HLQ/LCQ to be able to race in a Division 1 race. Those drivers qualified for a Division 1 SA simGT Series through a SA simV8 Series race, or a SA simGP Series race, must be seen to be practicing on the server by the day before the race to confirm their entry to the Division 1 race, the 105% rule also applies. Note: Those drivers who qualify for a Division 1 race by achieving a Top 3 result in a Division 2 race, regardless of which championship, must produce a lap time in HLQ within a 105% of the fastest lap time in order to complete their qualification. If not achieved, the next driver with 105% achieved will automatically take over the entry. Drivers must qualify within 105% of the lap time achieved by the fastest driver in their qualified division, in the HLQ session. Should a driver not achieve a 105% of the fastest lap time, a driver can be excluded from a particular round should there be no suitable division for the driver in question. **Drivers must complete 90% of laps completed by the race winner to earn points. Team points will be the sum of the points earned by each of their drivers according to section 3.1. Drivers may use factory driving aids that are specific to each car. Traction Control (TC), and Assisted Braking System (ABS). Electonic Stabilty Control (ESC) is not permitted. No driving aids. Traction Control (TC), Assisted Braking System (ABS), and Electonic Stabilty Control (ESC) is not permitted. Drivers must stay within the track limits demarcated by the white line, unless otherwise specified for a particular track by the race steward. A driver will not be penalised if two tyres are within the white lines of a track. If a driver is seen to be gaining an advantage a time penalty may be added to the drivers overall race time. If a driver leaves the track the driver may return to the track by re-joining in a safe manner to not hinder any other drivers and to not gain any advantage. The policy of waiting for another car to re-join in front of you after causing initial contact is in place for this season. The offending car is to wait off the racing line until the other car has re-joined safely before continuing. A warning system can be used to advise drivers of better conduct during future races. In the event of racing incidents which are considered not severe enough for a penalty by the Race Steward, drivers can be given a warning which includes strong advice as to how to conduct their driving in future. Once the offending driver is given a third warning, the offending driver will automatically receive a penalty for the race the final warning was issued for. users to connect to SIM RACE SOUTH AFRICA’S server. If a driver experiences a higher ping rate consistently than 300MS, the driver is expected to retire from the race in a safe manner away from the racing line as to not affect other competitors in anyway. If a driver fails to do so and in the efforts of supporting a successful racing event, the race director is obliged to ‘kick’ the driver from the server without prior notice. As this championship will be broadcasted on Youtube all efforts must be focused on providing a race which is as close to the real thing as possible. If a driver continues to show signs of erratic or unnatural driving behavior; the race steward has every right to remove the driver from the relevant race or the entire championship. For the current season, only Division 1 races are planned to be live streamed. Whilst every care is taken to produce race videos of the championship races, no liability will attach to SIM RACE SOUTH AFRICA for any unforeseen circumstances leading to a failure to produce a race video. and the possibility of securing sponsorship deals. Teams are encouraged to share the race videos. ***This document may be updated or changed at any time. © 2015 Sim Race South Africa	Blog at WordPress.com.